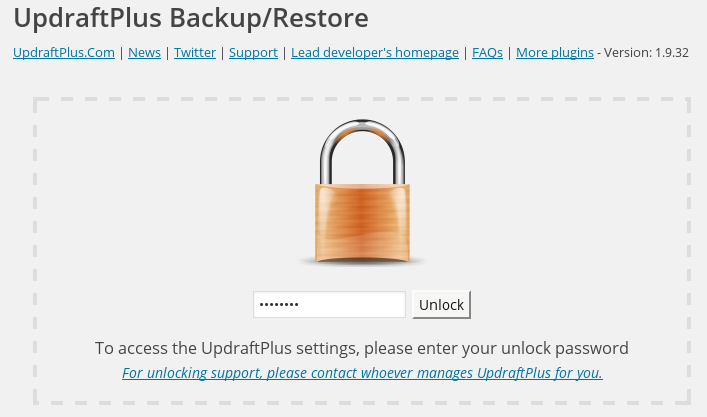 Lock UpdraftPlus settings to limit admin access? Lock UpdraftPlus settings to limit admin access? Don’t forget to remember your password! If you forget it, then there’s an FAQ for how to get back in., assuming that you have write access to the WordPress installation (files or database). This lock feature isn’t meant to provide unbreakable security, but to be a convenience feature to prevent mishaps and casual nosiness. If someone has an unrestricted administrator-level WordPress login, then ultimately there are ways to do anything to the site: that’s the point of an administrator login.